Do you have many downloaded movies which takes a lot of space on your computer? Do you have videos taken on vacation, wedding or friends gatherings and want to share them with your friends and family? Do you want to archive the movies that you have scattered on your hard drive? Try AoA DVD Creator! It provides you a handy tool to create or convert your movies into DVDs that you can watch in your home DVD player. Creating your own DVDs with AoA DVD Creator is so easy. Drag and drop video files into the program, click "Start" and it's done! 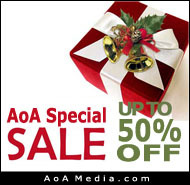 Obtain and install AoA DVD Creator. Click the "Add Files" button to add the video files that you want to burn to a DVD. Or drag and drop the video files directly to file list window in the program. To make sure you've added the right file, click on a video in the list and you'll see the first picture of the video. You can also order the videos as you want with the up and the down button. If you just want to burning your favorite part of a video, select the video in the file list and then click "Movie Clip" to select the video range to copy. Click the "Start" button to begin burning the video files to a DVD. If you want to save the project for future burning, select "Save to Hard Drive" and sepecify an output folder. This DVD Creator application is the best one I've ever purchased. It's completely full proof and simple to operate. The sounds are perfectly coordinated with the images when producing the DVD. It's the type of program that users love because it's (1) easily installed; (2) an elegant and intuitive user interface; (3) and does exactly what it's supposed to do. I'm a retired Senior Systems Analyst with 25 years experience dealing with information systems in large corporations. This DVD Creator is the type of software I.S. professionals love to support because, well, it creates no additional software support issues once installed. So, thank you to the programmers and analysts for producing an excellent product. I am very pleased with this program! It works much better then I would have thought possible and it is so easy to use. Thanks for creating such a fine product. Worked well from demo and was reasonably priced. Also attracted by easy to use and understand interface. No comments apart from the product appears to do just what it says it will with no unnecessary bells and whistles - just how i like it.